Purchase as set Save $20! 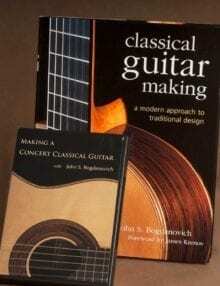 The perfect guitar building book/dvd set from well known luthier/author John Bogdanovich. Excellent instruction displayed in amazing detail. Pick up new skills, get tool tips and learn to master guitar building techniques. Different guitar building techniques and guitar designs in each. Additional 20% Discount for all Subscribers! In this dvd John shares his years of plane making experience and demonstrates the construction of a bench plane, and a compass plane. A bench plane is the most commonly used plane in any shop. Its many uses include joinery, smoothing and thicknessing. The compass plane is a curved bottom plane used to scoop out a concave surface. If constructed properly the performance of these planes can rival any plane on the market. A 20% Discount for all Subscribers!